Right across, Lesotho – and indeed this entire region from Swaziland through to Namibia – had been suffering from a prolonged drought. Farmers had been trucking in feed to keep their cattle from starving in the Free State. But then, towards the end of our first week in Lesotho, at the end of our horse-riding trip, the first real rain began to fall. It started simply as one of those afternoon storms, where the clouds gradually build over the course of hours, then the lightning strikes some distant hill and before long the precursory wind is blasting you and then the heavy drops begin to fall. They fall fast and hard and you have to take cover. The thunder cracks overhead and the sky flashes. But all too soon, the storm passes, the rain stops and that wonderful wet earthy aroma fills the air instead. Those short afternoon storms are not enough to amend the damage of the drought – too little too late. But what came next, over the following weeks – was enough to turn the land green again. Now the locals were calling it a green drought. Appearances can be deceptive, you know. 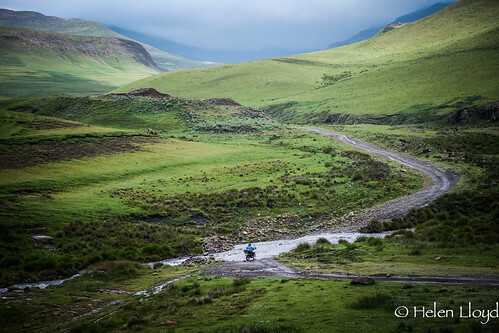 And so the day we packed to leave Malealea Lodge to begin our motorbike ride across Lesotho, clouds were in the air and the outlook was for rain. Then, all of a sudden, as we were stood by our bikes, gearing up, a bolt of lightning struck Jimmy’s bike right between us. Bam. Jimmy’s heart skipped a beat and I looked on in bewilderment. Did that really just happen?! It did. A lady who had been sat in her office came out, hand on heart, also stunned by our narrow escape. 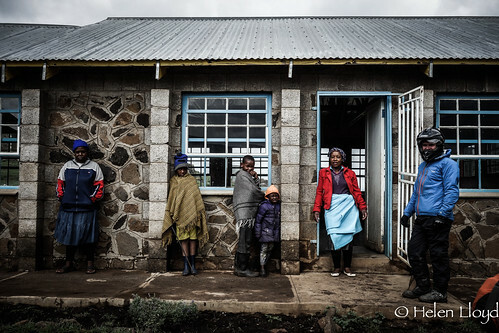 Lightning kills a lot of people in Lesotho each year. We didn’t want to be one of those statistics. But two nights later we were chancing our luck again. 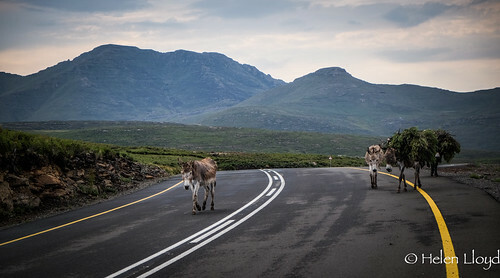 We’d been riding from Semonkong towards Sehlabathebe in the southwest. It had been a long day and so I suggested we stop and wild camp overlooking the south-facing escarpment. 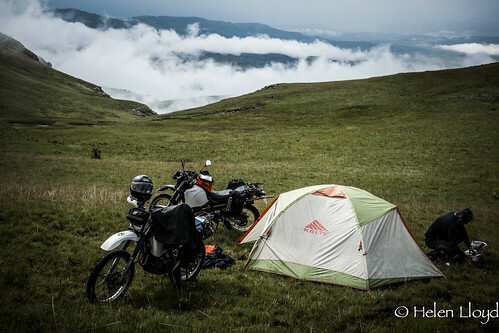 I’d been looking forward to wild camping… Pitch found, tent up, dinner done, the clouds started building and before we knew it, we were in the tent taking shelter. The thunder rolled overhead, the lightning flashed repeatedly all around blindingly. We lay on our roll mats in silence, both thinking that this wasn’t perhaps the best spot to camp. There was nothing we could do now. As I sat up to reach out to make sure the zip was properly shut, Jimmy suggested it might be safer to lie down. On that high open ground with not a tree or building in sight, we were the most prominent lightning attractors. I lay down. And the silence between us contested the deafening thunder overhead. Part of our first day’s ride across Lesotho had been on smooth newly built (by the Chinese) asphalt. The road wound around the hills, never straight, never flat, until we came out onto a level(ish) wide valley. It could have been mistaken for Rannoch Moor, the grey clag adding to the illusion. The difference being that other traffic were donkeys, not cars. Now though, beginning our third day, we were well and truly getting onto the nitty gritty trails. And as we ascended the pass, the rain began. 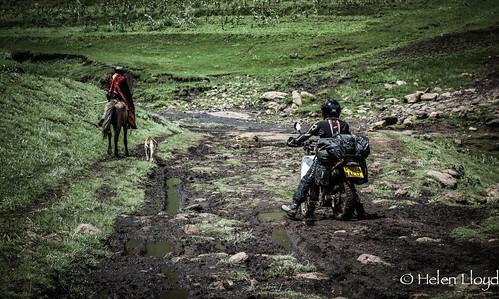 The rivers were bulging making for some interesting crossings. To begin with we were cautious, me having not done many river crossings. Then, as we descended the next valley and the rivers were flowing faster and deeper, we were cautious because we had to be. One of us (usually Jimmy) would wade out to check the route first, water rushing over the tops of our boots, slipping on rocks, and the sand giving way underfoot threatening to take us downriver. Later, ever preferring the dirt tracks to tarmac, we decided to try the 4×4 track from near Katse dam across to Mokhotlong. It had stopped raining just long enough to think we may be able to make it. It was much slower than we expected. After about 15km we passed the only other vehicle we saw on that track, a Toyota Hilux – stuck at a muddy stream. We smiled, just a little smugly as we bumped and rattled past. But then the rocky sections began, uneven and steep. Bikes in first gear, revving loudly, straining under the weight. I dropped my bike once… twice… and then… wait for it… Jimmy dropped his. Now, in the two years I’ve known and been riding with Jimmy, he’s not once dropped his bike. He’s had a couple of wobbles, but always righted himself in time. So it was with some (sick) pleasure that I calmly parked my bike on the trail and went over to help him pick it up. Admittedly, he could have managed without me… by now, going so slow, we had picked up about fifty stragglers and gawkers from the village and any one of them would have helped him – for a financial reward (actually, he couldn’t have managed because I had the wallet). Jimmy muttered something about a slipping clutch and that was why the bike had fallen and thinking it maybe wasn’t wise to continue with such a fault. Me, beginning to wonder if we’d bitten off more than we could chew, was also wondering if we should turn around. Not wanting to give in that easily, and since the light was fading on yet another day and the black clouds were edging nearer, I suggested we stop and camp and leave the decisions until the morning, when we’re rested and thinking clearer. I asked the schoolgirls if there was somewhere we could camp in the village. One enterprising girl said we were welcome to stay with her family for a few Maluti (the local currency). Instead, I asked where I could find the teacher to ask if we could camp at the school. Upon speaking to the headmistress, she immediately said we could put our tent in the staff room and that there would be a security guard on duty all night so we would be safe. And that is how we avoided getting drenched in the ensuing downpour which lasted through the night. 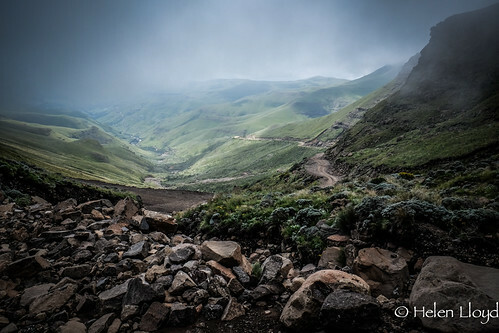 The next morning, still raining, the paths were flowing a muddy orange, and local boys were wrapped in their blankets, balaclavas pulled over their faces (which seems to be the latest take on the traditional Sesotho outdoor clothing) as they watched over their goats and cattle. We could make excuses but let’s just say, sensibility got the better of us and we turned round and retraced our steps. 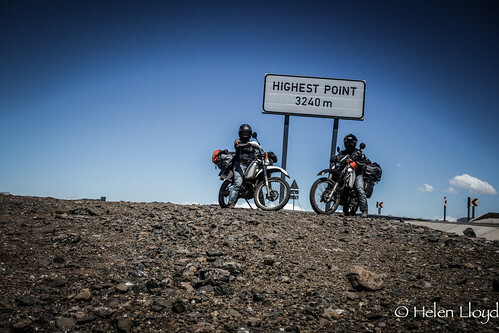 But later, when we were sipping an expensive beer in Africa’s Highest Pub at the top of the Sani Pass, we overheard a 4×4 tour group leaders saying that the route we’d turned back on was impassable – a bridge down just beyond the pass we had nearly reached the top of. So we couldn’t have made it anyway. Maybe. Less and less I see these decisions as failures. Sure, we didn’t make it. But these uncompleted challenges remain to be tackled – added encouragement to return to these places that hold so much appeal.